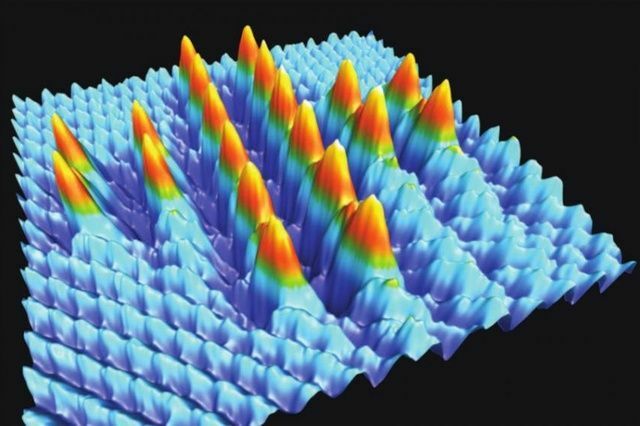 The formation of DNA supramolecular nanostructures was directly observed through AFM measurements. 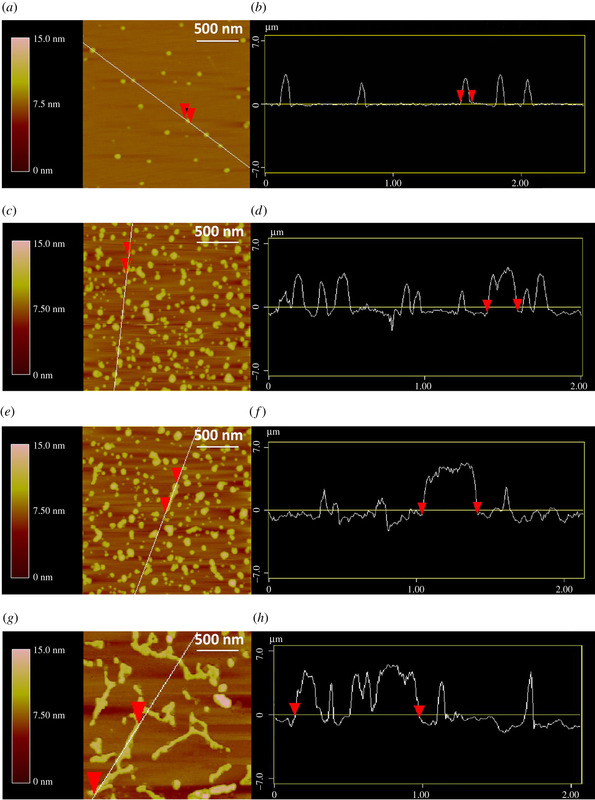 Atomic force microscopy (AFM) was performed using NANOSENSORS™ PointProbe® Plus PPP-NCHR tapping mode AFM probes. Figure 5. from “5′-(CGA)n sequence-assisted pH-controlled assembly of supramolecular DNA nanostructure” by Yuting Yan et al. 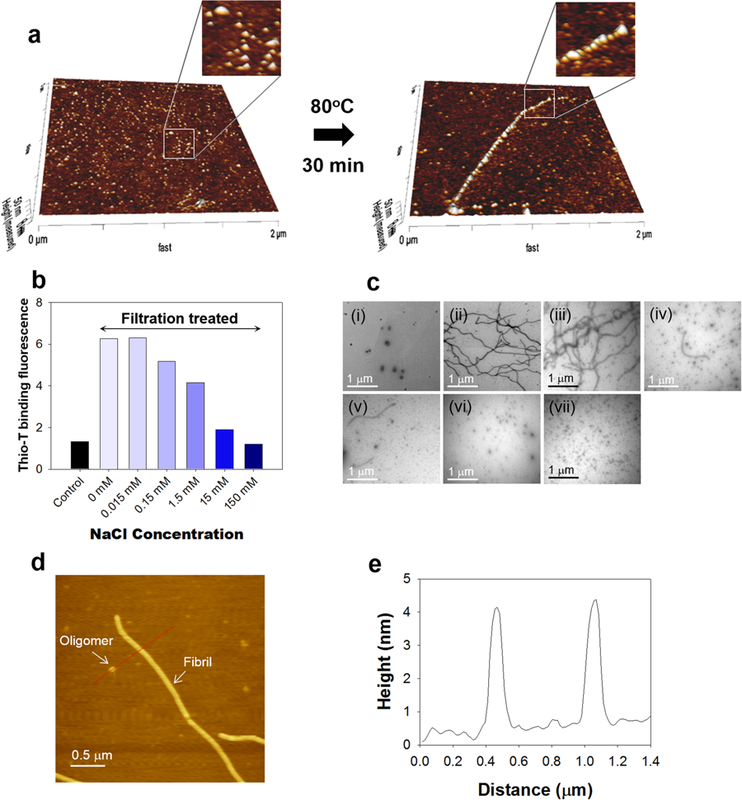 : AFM images of the nanostructures formed by DNA G-quadruplexes self-assembly in KOAc buffer solution; (a,b) SG2 at pH 9.0, (c,d) SG2 at pH 4.5, (e,f) a mixture of SG2 and CSG2 at pH 4.5, (g,h) a mixture of SG2 and CSG2 at pH 9.0. The length of side is 2 µm and the scale bar is 500 nm. Open Access: The article “5′-(CGA)n sequence-assisted pH-controlled assembly of supramolecular DNA nanostructure” by Yuting Yan et al. is licensed under a Creative Commons Attribution 4.0 International License, which permits use, sharing, adaptation, distribution and reproduction in any medium or format, as long as you give appropriate credit to the original author(s) and the source, provide a link to the Creative Commons license, and indicate if changes were made. The images or other third party material in this article are included in the article’s Creative Commons license, unless indicated otherwise in a credit line to the material. If material is not included in the article’s Creative Commons license and your intended use is not permitted by statutory regulation or exceeds the permitted use, you will need to obtain permission directly from the copyright holder. To view a copy of this license, visit http://creativecommons.org/licenses/by/4.0/.